I’ve definitely run into this myself a few times. And I’ve talked with customers who wonder how these files appeared, what they need to do about them, and how they can be avoided. Here’s the scoop. Why do I have files marked “conflicted copy”? Although it might seem like an error, a conflicted copy is actually SecuriSync’s way of protecting you from a possible overwrite. Versioning on its own is a great feature, because it makes it simple to retrieve data that, without SecuriSync, would otherwise have been lost forever. But versioning also protects you from shared file conflicts. Without this protection, if two people opened, edited, and saved the same file at the same time, one person’s changes would overwrite the other person’s file. So SecuriSync uses the “conflicted copy” tag to alert both of the users that they’ve got two versions of the same source file, and that one contains information that the other doesn’t have. What can I do to prevent file conflicts? To prevent this problem, you can “lock” a file when you open it. 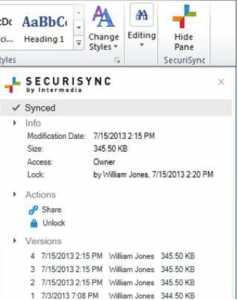 You can do this using the Microsoft Office plugin, but you can also do it via the SecuriSync web portal. This forces collaborators to open a “read-only” copy of the file..
Locking a file is easy. Just select “Lock” from the Action menu for a given file. How do you fix “conflicted copy” files? If the conflicted file is a Word document, you’re in luck: Microsoft Word is really good at helping you spot and merge the differences between documents. You can use the “Merge Documents” or “Compare Documents” in the Tools menu. Unfortunately, there are no features like this in the rest of the Office apps or in most non-Microsoft apps. Still, it’s better to have the option for manual conflict resolution than losing your data entirely. For a more technical description of “conflicting copy”, here’s the SecuriSync knowledge base article.